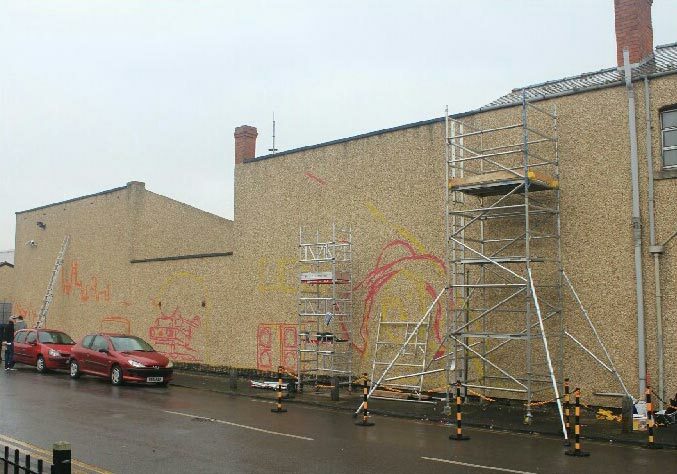 If you have driven by Mitchells Gloucester office or walked down Bristol Road over the past few weeks, you might have noticed something new and very much outstanding, with a stunning, modern and fresh piece of artwork from local street artist “Trix”. Mitchells were delighted to commission Trix to make the dreary, pebble dash wall into not only a great advert for the company, but to also make the outside of the building look vibrant. Not only has he achieved this, but he has gone beyond what they could have hoped for, delivering a fantastic piece of art that showcases the services offered, in a different way to most other advertisements in the city (and probably the country). The timing of the outside upgrade is also in line with the general re-generation of the docks and Bristol road canal corridor and also as part of the city clean up ahead of the rugby world cup, which comes to Gloucester this year. 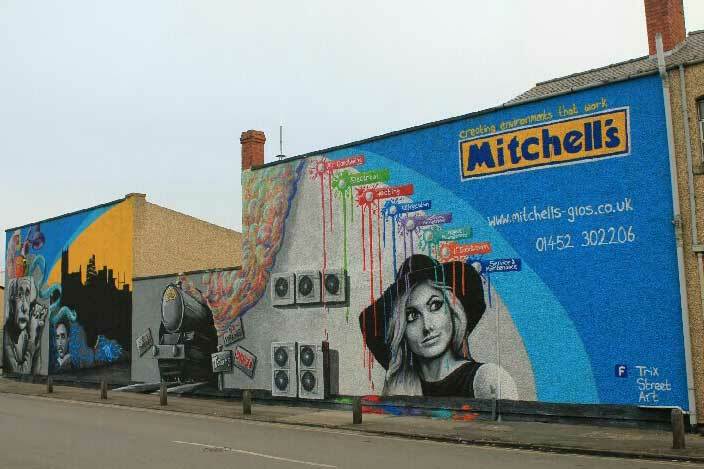 Although Mitchells are a traditional, historic and well established company, having operated in Gloucestershire and the surrounding counties for over 100 years, they wanted to make both new and existing customers aware of where they are located and what they do, and the idea of street art was to be a little different and maybe radical, which has led to much interest in the company and some fantastic feedback. The wall art follows the traditional company image, which is based on the recent upgrade of vans and website, which also went live at the same time as the new wall art. Featuring Einstein, Nicole Tesla (the inventor of AC Electricity) and a train to link the GWR as an integral part of Gloucester and the South West, Trix has captured everything the company has to offer, along with local and industry links which are a talking point around the city. “We discussed an initial brief of a copy of our van signs and the incorporation of condensing units (AC is a main part of what we do) and I suggested he could make the condensing units look like they had been graffiti’d. Trix created a sketch mock-up of the first part of the wall and then we had a brain storm to decide what else should be incorporated. We wanted a Gloucester(shire) link as we are a long established local firm, hence the skyline of the cathedral, tall ships and rugby posts. All of our team are delighted with the end result, as am I, and we know that for years to come our office and HQ will be a talking point of the city, for all the right reasons”. So, if you haven’t seen it, now is the time to head to Gloucester and have a look, but just in case you cannot make it just yet, we have some pictures of before and after below. ‹ When Was The Last Time You Had Your Air Conditioning Serviced?